In an issue of the magazine Scientific American, the editors observed that “whenever we run articles on social topics, some readers protest that we should stick to ‘real’ science” (The Peculiar Institution, 2002, p. 8). You and I are confident about the scientific stature of psychology, but who in APS hasn’t felt the icy skepticism of a fellow traveler on a flight after you respond to the question, “What is your occupation?” You may therefore be pleasantly surprised by a scientometric study entitled “Mapping the Backbone of Science” (Boyack, Klavans, & Borner, 2005).1 The article is must reading for deans who oversee scientific psychology departments. I will explain why shortly. But first, some background. In the Middle Ages, theology and philosophy were a dynamic duo of hub disciplines around which the other sciences were organized. These two areas influenced thinking across the various fields of scholarship (Leydesdorff, 2006). The past three centuries have seen unparalleled advances in science. During this time, there have been scientific theories of invisible forces operating with measurable effects, such as in the case of magnetism, gravity, and dark matter. Natural philosophy became identified with physics, which, with mathematics, took on the role of the hub discipline of science. Scientific research during the past century has continued to accelerate in terms of quantity and impact. People may reminisce about the good old days, but thanks to science and technology the amount of total income spent on the necessities of food, clothing, and shelter dropped from 80 percent in 1901 to 50 percent in 2002/2003 (U.S. Department of Labor, 2006). The explosion in the number of scientists, scientific specializations, journals, and research articles over the past century has been just as extraordinary. Given these dramatic changes, are the sciences still organized around a central discipline or two? Has the rapid period of expansion produced several hub disciplines? Or have all the scientific disciplines matured independently and sufficiently such that there is no central, inherent overall structure in the sciences? Boyack and colleagues sought to answer these and similar questions. Scientometric and bibliometric analyses have been in place to identify clusters of authors, papers, or references, but only recently have computing capabilities, computational algorithms, and visualization techniques emerged that permit the analysis of large-scale document datasets. Boyack and colleagues quantified the patterns of scientific influence within and across the sciences based on citation data from more than one million journal articles appearing in 7,121 natural and social sciences journals published in 2000. For a source of high-quality citation data, they turned to the Science Citation Index (SCI) and the Social Science Citation Index (SSCI). The use of the SCI and SSCI also made it possible to use individual journal articles, rather than entire journals, as the unit of analysis. Among the limitations of using the SCI and SSCI are that conference and workshop proceedings are not indexed and that non-English-language journals are less likely to be included. Eight different approaches to quantifying citation patterns were used to ensure structural accuracy, where accuracy means that journals within the same subdiscipline were grouped together, and groups of journals that cite each other were close to each other. Additionally, new visualization techniques were used to generate a two-dimensional spatial map of the sciences based on each metric. Finally, the validity of these maps was compared using two different accuracy measures. The best measures converged on the landscape of scientific influence. The resulting mapping of science provides a visual depiction of where each scientific discipline is, what is around it, what its relationships are to its neighboring disciplines, and how strong its impact is on the neighboring disciplines. Figure 1. 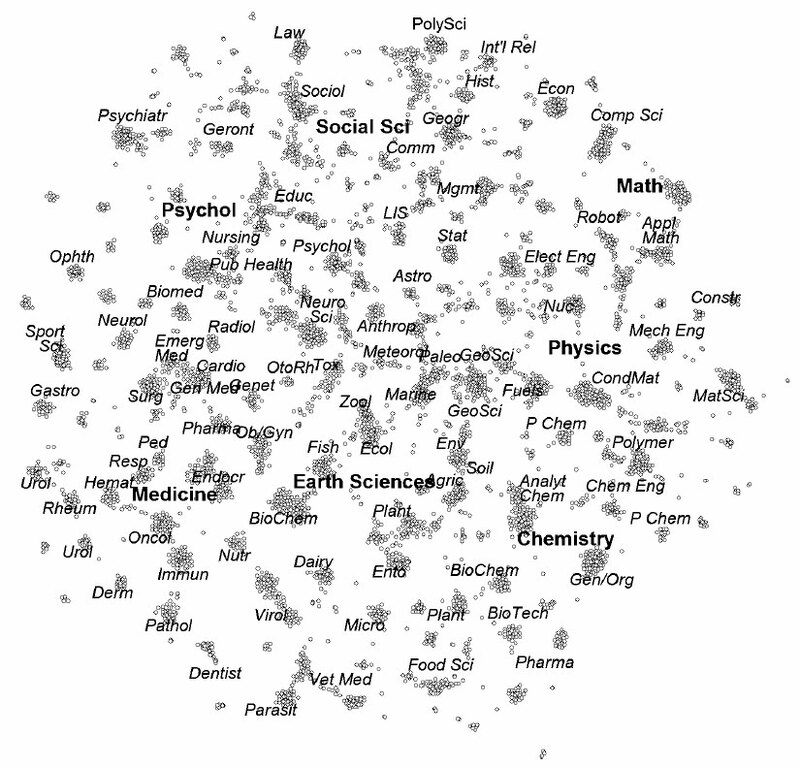 Map of science generated using a similarity measure based on co-citations. Large font size labels identify major areas of science. Small labels denote the disciplinary topics of nearby cluster sof journals. From Boyack et al. (2005). The results are presented in Figure 1. Not surprisingly, given scientific specialization over the past century, contemporary sciences no longer originate from a single source. Instead, seven hub sciences can be identified: mathematics, physics, chemistry, earth sciences, medicine, psychology, and the social sciences. Yes, psychology emerged as one of the hub disciplines of science! The location of many of the disciplines has face validity as well. Electrical and nuclear engineering fall between mathematics and physics, chemical engineering and analytic chemistry fall between physics and chemistry, and statistics falls between mathematics and the social sciences. More interestingly here, public health, neuroscience, neurology, radiology, cardiology, and genetics are among the sciences that fall between psychology and medicine, whereas education and gerontology fall between psychology and the social sciences. The more insular the field, the closer a field will lie to the outside of the map. Those with many interdisciplinary linkages are more likely to lie toward the middle of the map. It is interesting, therefore, to note that psychiatry, law, political science, and economics all lie along the outside, whereas psychology is closer to the middle, reflecting its interdisciplinary nature. Another map depicting the linkages among scientific fields confirmed that psychology is a hub discipline — that is, a discipline in which scientific research is cited by scientists in many other fields. For instance, medicine draws from psychology most heavily through neurology and psychiatry, whereas the social sciences draw directly from most of the specialties within psychology. 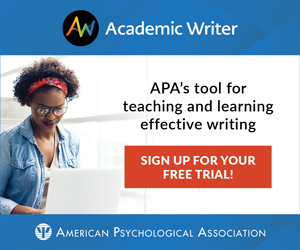 During a period in which our national leaders appear more likely to identify psychology with the work of Dr. Phil and Dr. Laura than with the thousands of scientists worldwide who make up the membership of the Association for Psychological Science, it is imperative that institutions of higher education make clear the centrality and influence of psychological science as well as the importance of maintaining and promoting its growth. Indeed, Boyack et al. (2005) noted: “Our interest in mapping science stems from a desire to understand the inputs, associations, flows, and outputs of the Science and Technology enterprise in a detailed manner that will help us guide that enterprise (or at least that portion of it operating in our institutions) in more fruitful directions” (p. 352). Most universities are organized along more traditional disciplinary boundaries, but decisions about both faculties and facilities could benefit from knowledge about the scientific disciplines that are especially central and influential. The results of Boyack et al. (2005) indicate that scientific contributions in psychology advance not only the discipline but many other scientific fields as well. I began this column with the observation by the editors of Scientific American that whenever they run articles on “social” science topics they receive protests from some readers who advise them to stick to real science. The editors of Scientific American went on to say that they seldom hear these complaints from working physical or biological scientists: “They are the first to point out that the natural universe, for all its complexity, is easier to understand than the human being. If social science seems mushy, it is largely because the subject matter is so difficult, not because humans are somehow unworthy of scientific inquiry” (The Peculiar Institution, 2002, p. 8). The importance and centrality of psychological science may not be fully understood by politicians, but the evidence is clear: The mapping of science shows psychology to be a hub discipline with a great deal to offer (and learn from) other scientific disciplines. Boyack, K.W., Klavans, R., & Börner, K. (2005). Mapping the backbone of science. Scientometrics, 64, 351-374. Editors. (2002). The peculiar institution. Scientific American, 286, 8. Leydesdorff, L. (2006). Can scientific journals be classified in terms of aggregated journal-journal citation relations using the Journal Citation Reports? Journal of the American Society for Information Science and Technology, 57, 601-613. 1 The study was kindly sent to the author by Eliot Smith. John T. Cacioppo is the Tiffany and Margaret Blake Distinguished Service Professor at The University of Chicago and the Director of the Center for Cognitive and Social Neuroscience. His current research falls under the rubric of social neuroscience, with an emphasis on the effects of social isolation and the mechanisms underlying effective versus ineffective social connection.